Before I get into the actual post can we just address the fact that I'm managing to continue a series for once! 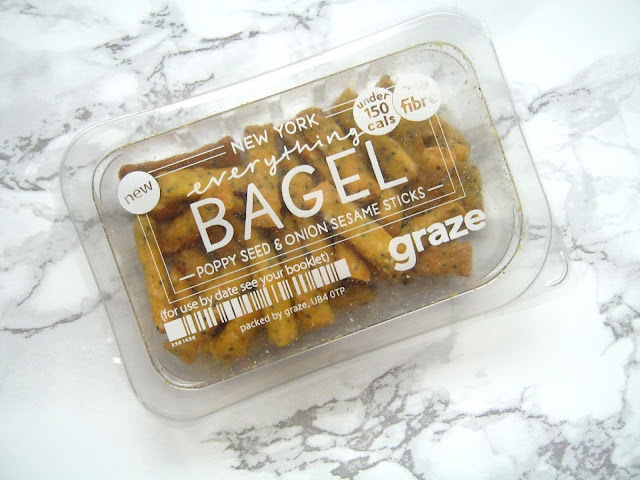 I began to continue this series of sharing what's in my graze box and what I think of the snacks inside last month and it seemed to go down very well so I'm back with another post. 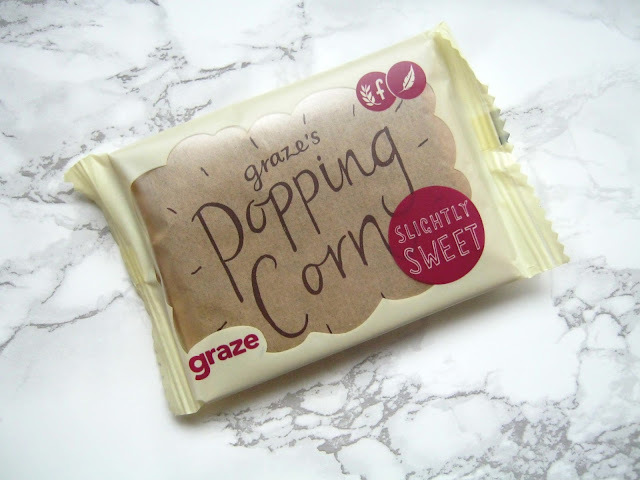 My box this time around was a good balance of sweet and savoury snacks, I do love a sweet treat now and again but over the past few months I definitely have become more of a savoury person so I was happy to see it was quite balanced! I was pleased immediately when I opened my box as all the snacks sounded great and I have to say they didn't disappoint. As I said in my last post I'm lucky enough to be an ambassador for graze now so from time to time they send me a few delicious snacks to try out and today's box was kindly given to me by them. I've been a big fan of graze for a long time though so being an ambassador for them doesn't change my opinion at all and of course I'll only ever be 100% truthful. Out of the two savoury snacks that I received this was definitely my favourite and I was pretty sure from the moment I saw it in my box that I would enjoy it. When scrolling through all the snacks on the website it is definitely one that has stood out a lot so I'm glad I enjoyed it. 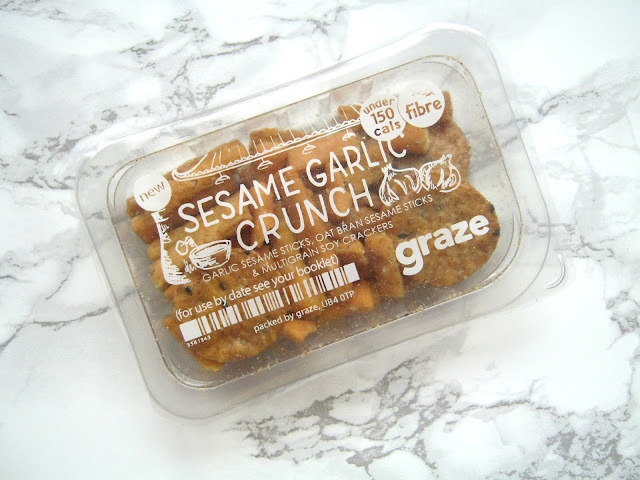 It was full of flavour and the perfect thing to snack on whilst I get some blogging done, I like that it had a lot of crunch to it as I'm definitely someone who eats too many crisps so this offers me a much healthier alternative to that! Another crunchy snack! This one is flavoured with garlic though which I love and it had more of a mixture of snacks in it compared to the one above. It contains oat bran sesame sticks, garlic sesame sticks and multi grain soy rice crackers. I definitely enjoyed the garlic sticks the most and surprised myself by really liking the soy rice crackers as they aren't something that have ever appealed in the past. I'll for sure be ticking love next to this one so I get it in a box again! 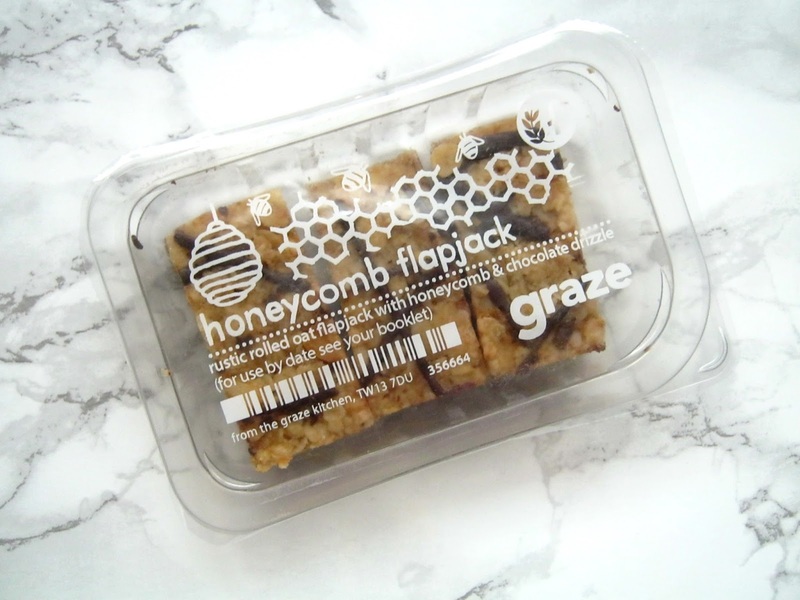 I'm a big fan of the graze flapjacks so it was no surprise to me when I tucked into this and found I really enjoyed it! I think I might have even had this one before but either way I loved it and always find that the flapjacks are just the right size to have after lunch or as an afternoon snack. I know they do a box which comes with just flapjacks in so I might have to give that a go next! Despite not being a huge fan of popcorn I do actually quite like the graze ones, I've tried this before and it's perfect for snacking on whilst watching a film. I really like that you have to pop the corn yourself which seems to be a bit of a novelty these days with all the pre-popped popcorn on the shelves in shops! I've tucked this away for a rainy day so I can enjoy it with a good film, hopefully my brother doesn't find it though as he's a big popcorn eater! 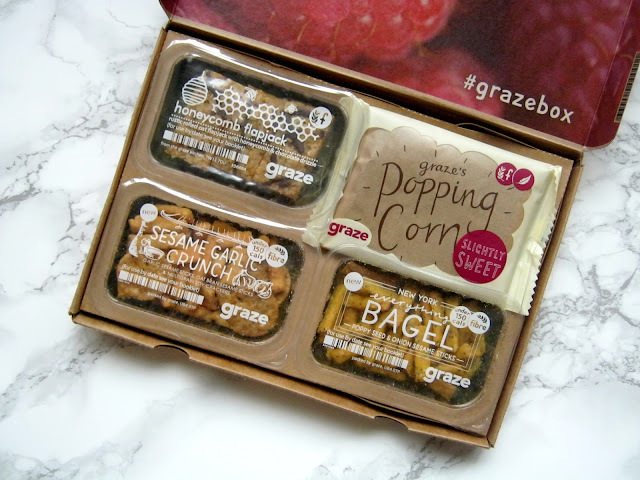 If you fancy giving graze box a go and you're a new customer then use my code SHONAC1HB to get your 1st, 5th and 10th box completely free! Ahhh I completely forgot how yummy Graze boxes are!! I used to get them delivered to my old office but completely forgot. Mmmmmmmmmm. You got some great picks in this one! I'm really enjoying Graze at the moment and often by the singles from Boots. I'm currently thinking about signing up to a monthly subscription so was hunting for a review about the boxes and found your post. From your review I really like the products inside they look great so I might look in to purchasing the subscription. Also like yourself I prefer more savory so it would be good if they can provide something where you can select the options you would prefer more in your box, if you get what I mean.